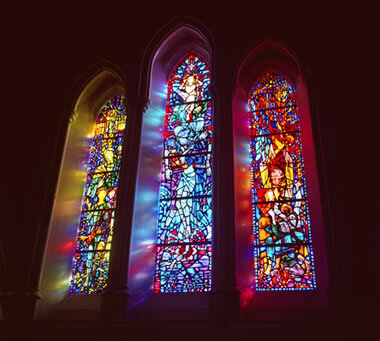 What Causes Color in Stained and Colored Glass? Stained glass windows: Three stained glass windows at the National Cathedral in Washington D.C. This is one of the most popular views of stained glass windows in the Cathedral. Image copyright iStockphoto / Coast-to-Coast. Color is the most obvious property of a glass object. It can also be one of the most interesting and beautiful properties. Color sometimes defines the usefulness of a glass object, but it almost always defines its desirability. 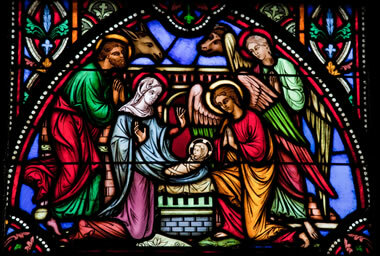 Stained glass window: The Nativity of Jesus is one of the most commonly rendered stained glass subjects. This window is located in the St. Michael and Gudula Cathedral of Brussels. Image copyright iStockphoto / Jorisvo. The earliest people who worked with glass had no control over its color. Then, through accident and experimentation, glass makers learned that adding certain substances to the glass melt would produce spectacular colors in the finished product. Other substances were discovered that, when added to the melt, would remove color from the finished project. Egyptian glass blowers: As early as 3500 BCE, the first true glasses were being made in Mesopotamia and Ancient Egypt. Beads and small blown-glass vessels were some of the earliest objects made with colored glass. Early glass artists were always experimenting to improve their glass and the objects that they produced. Image copyright iStockphoto / ilbusca. The Egyptians and Mesopotamians both became experts at the production of colored glass. In the eighth century, a Persian chemist, Abu Musa Jabir ibn Hayyan, often known simply as "Geber," recorded dozens of formulas for the production of glass in specific colors. Geber is often known as the "father of chemistry." He realized that the oxides of metals were the key ingredients for coloring glass. 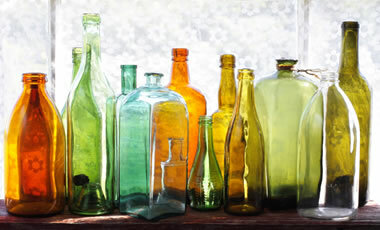 Colored glass bottles: Colored glass bottles were some of the first items manufactured in quantity by early glass blowers. The colors were decorative and they also protected the contents of the bottle from light. Image copyright iStockphoto / Maasik. Once the methods of colored glass production were discovered, an explosion of experimentation began. The goal was to find substances that would produce specific colors in the glass. Some of the earliest objects made from glass were small cups, bottles, and ornaments. Religious organizations were among those who provided incentive to the early glass artisans. Stained glass windows became very popular additions to churches, mosques, synagogues, and other buildings of significance over 1000 years ago. The artists who made these windows needed a full palette of colors to make a realistic stained glass scene. Their search for a full palette of colors fueled research and experimentation to produce a vast array of colored glass. 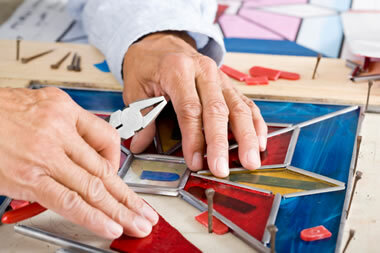 Stained glass panel: A stained glass artist works to assemble a panel using pieces of glass that are cut to shape and held in place by lead came. Image copyright iStockphoto / KKali Nine, LLC. Then, another problem was discovered. Many of the glass colors did not stand up to year-in, year-out exposure to the direct rays of the sun. The result was a stained glass scene of deteriorating beauty. Some colors darkened or changed over time, while others faded away. Red, a very important color for use in a stained glass window, was especially vulnerable to fading. Artists in many countries worked to produce a red glass that would hold its color through the years under the direct sunlight that passed through the windows. Eventually a permanent red color was developed by adding small amounts of gold to the glass. This significantly increased the cost of the glass, but the red color was achieved. Even today, if you purchase a red sheet of glass it will cost significantly more than any other color. 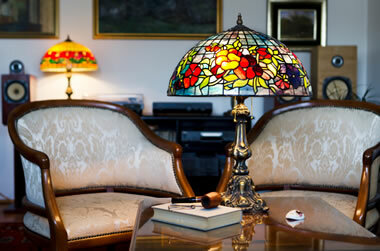 Stained glass lamps: Lamps with beautiful shades made from colored stained glass. Image copyright iStockphoto / milosljubicic. 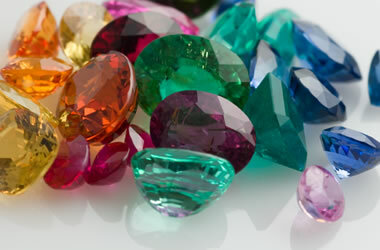 Glass gemstones: Some of the most common items made from colored glass are colored beads and imitation gems. The color of these items can be precisely determined by the chemistry of the glass. Image copyright iStockphoto / buckarooh. The recipe for producing colored glass usually involves the addition of a metal to the glass. This is often accomplished by adding some powdered oxide, sulfide, or other compound of that metal to the glass while it is molten. The table below lists some of the coloring agents of glass and the colors that they produce. Manganese dioxide and sodium nitrate are also listed. They are decoloring agents - materials that neutralize the coloring impact of impurities in the glass. Depression glass bowl: A "cobalt blue" nut bowl of the Royal Lace "depression glass" pattern manufactured by the Hazel Atlas company of Clarksburg, West Virginia and Zanesville, Ohio. Photo copyright Depression Glass Antiques. Related: Metals are also used to color fireworks! Some colors of glass are widely known. 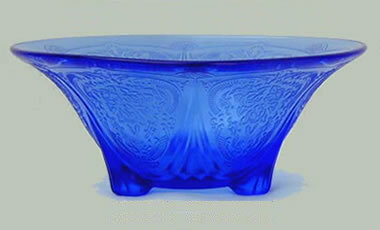 Perhaps the best example of this is "cobalt blue" that is produced by adding cobalt oxide to the glass melt. "Vaseline glass" is a fluorescent yellow-green glass that contains small amounts of uranium oxide. "Ruby gold" and "cranberry glass" are red glasses produced by the addition of gold. "Selenium ruby" is a red color caused by the addition of selenium oxide, and "Egyptian blue" is produced by the addition of copper. Colored glass lights: Many Christmas light bulbs made in the early 1900s consisted of a colored glass globe and interior filament. The color of the globe determined the color of light that passed through. The sources of the oxides, sulfides, and other metallic compounds used to color glass are minerals. These minerals are typically mined, processed to remove impurities, and used to manufacture coloring agents for glass. The keys to beauty often come right from the Earth.